While I would love to have a handwritten journal, I just don't make time to do it. Because I am in front of the computer 80% of the day, my blog has become somewhat of a journal. I [heart] blogging for this reason. For 2009 I would like to share the happenings of my life and hopeful that some of that information could be valuable to someone else. Are you ready for My Office - part 6 and last installment? Before I get started I want to cover a great question that I received. Frances: Do you work standing up or sitting? Great question Frances! I do both - mostly standing but when I do sit I have a counter high chair that I found at Pier 1. 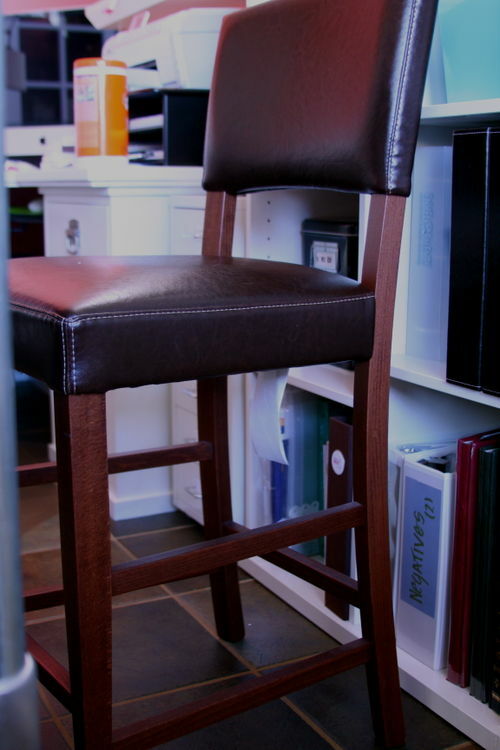 It has a back and is cushy leather. It was on SALE for under a $100! Just a reminder that my worktable isn't set up to sit at because there is no place to really put your knees. So if you like to sit this is something to take under consideration. In the coming weeks I will be putting together a video showing you my room and also a video of my work flow when scrapbooking. Of course I need Kirk to be in town and a good hair day! Now I am going to show you areas of inspiration for me. 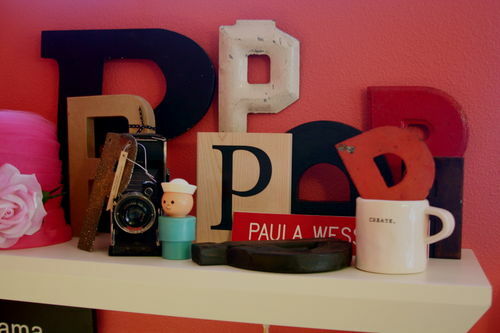 I like to collect things old and new and finding ways to display them in my area. These two display shelves are above my computer area. 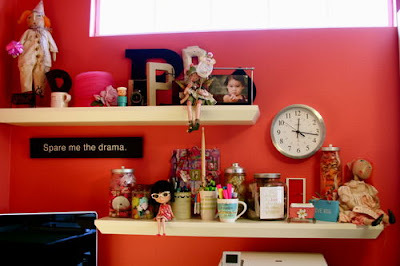 I might be switching these shelves to the other wall (to the left) because I would like to hang something else here. Artwork and more inspiration boards. The doll at the very end standing is 'Birdie'. She was made by Chrissy and Lulu and I had to have her when I read her description: She is a free spirit. Loves to dance & sing (badly) If there is a ruckus in the doll room, we know Birdie was on a tear. Caution: Birdie will not follow rules. Hide the chocolate. The next doll sitting represents my love for fairies. Her name is Milli and she celebrates July. This gal does some amazing work and you need to go very early to the local craft show or everything will be sold out. 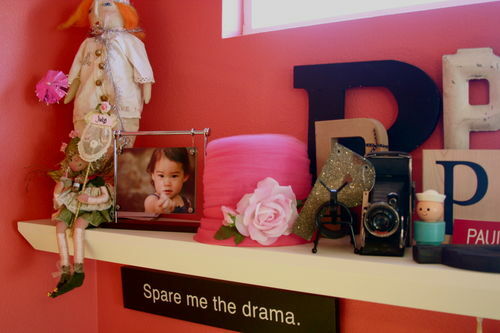 The other stuff is my collection of random 'P's, old hat, old camera, fisher price toy...the spare me the drama plaque - right now it has to be my all time favorite piece. I found this at the right time in my life. The bottom shelf you can see the beginnings of my ribbon storage! This is also done by color and I use misc jars from Target, Goodwill and Ikea.The dark haired doll on the end is my first Blythe doll - Love Mission. I haven't spent as much time as I would like with her but plan on buying some stuff when I go to Japan and get more involved. The cute little red door is my Fairy door. If you are looking for special gift this is perfect. It comes all packaged with directions and even fairy dust! The doll at the very end (you can see her better up top) is Penny (from Chrissy & Lulu). You can see the door to the left - and a glimpse of Jesse! I have moved the dog beds, they are usually right in front of the bench. 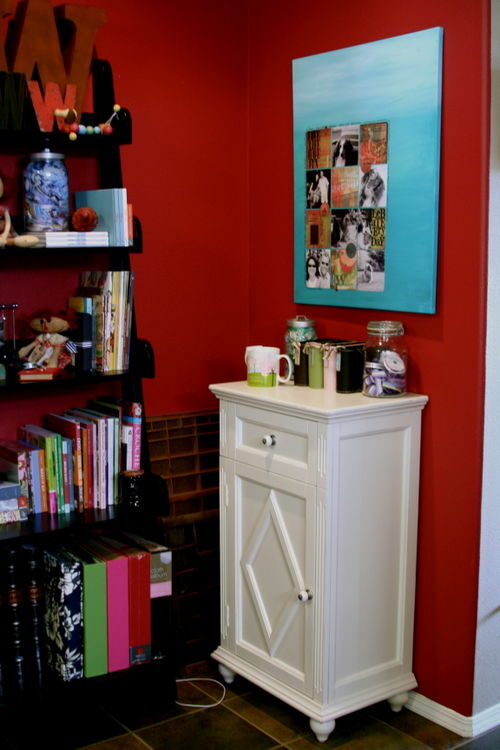 The walls are painted a Hunting Coat Red by Ralph Lauren. Again I had my local hardware/paint store mix this color for half the price. So finding furniture for this area proved not any easier than the office furniture. I was looking at cabinets, amoires, shelving units...they were either WAY out of my price range or on the other end of them spectrum not very well made. 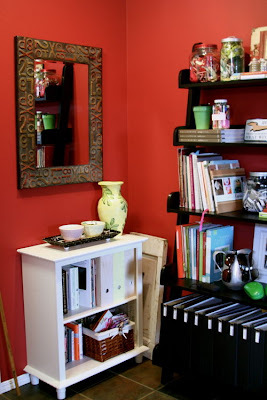 This is our entryway 'area' - the mirror was a steal at Kohls for $25 and the white shelf is from the Shabby Chic line at Target. 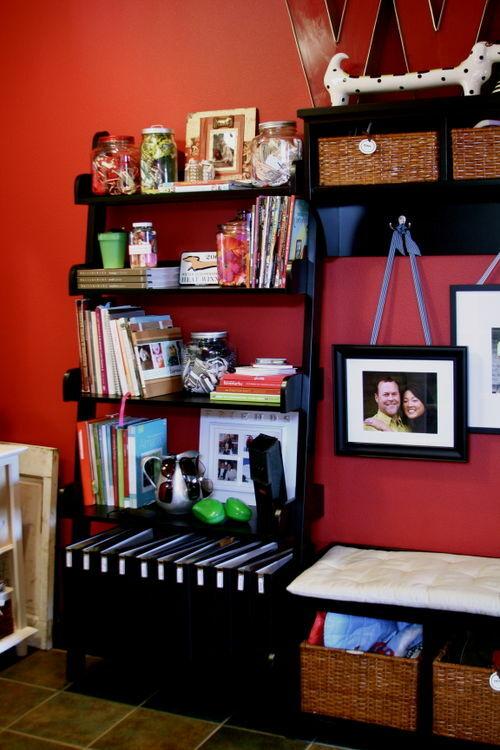 This shelving unit holds some business books and a baket of mini albums. the ceramic pieces on top - bowls found at TJ Maxx is a catch all for keys and the vase is made by a Hood River artist Trudi Klinger/Mystic Mud Studios. 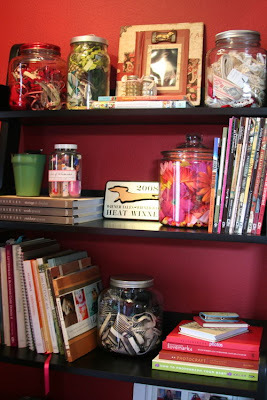 This is the first section of the unit - you can see my ribbon jars and books. These books are organized by subject - home decorating, altered art, scrapbooking and photography. I have really narrowed down these books and only keep those that I reference regularly. The bottom of the shelf is my Library of Memories. 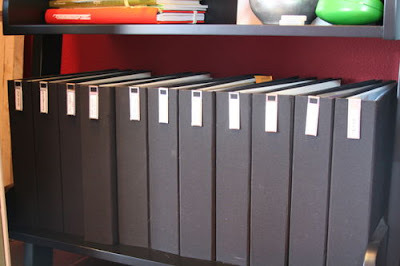 I use the American Crafts Cloth albums in black. The metal tab holders on these albums were from AMM, but they were discontinued. But I found something very similar from CTMH. I apologize for the blown out shot - there is very little natural light in this area and I am not very good with the camera - that's another post! 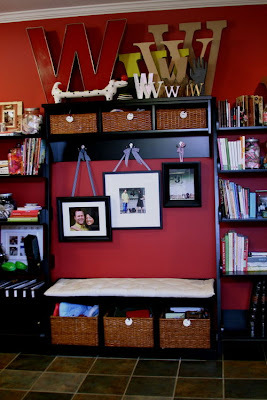 Here is the middle of the unit - my 'W' collection. One of my favorite finds was the big red one on Ebay. You will also see my dachshund collection scattered about - I know that you should display them all together but because the subject matter is so LONG that is hard to do! The baskets up top hold gloves, hats and scarves. Stacy's mom had the brilliant idea to hang pictures from the hooks with ribbon! I plan to hang some more to create a layered effect. All these photos were taken by my amazing friend Allison. If you are ever, I mean ever want THE best picture taken of yourself - fly to Mesa, AZ, just do it. You won't be disappointed. She can feel that inner beauty in you and bring it forward. AND if you are already a budding photographer and want to learn more, her class is open for registration at Big Picture. Of course I can't even figure out my white balance, so I still can't take the class! The bench needs some pillows, I am hesitant since Amos hangs out here. So the pillows would become a very expensive dog bed. 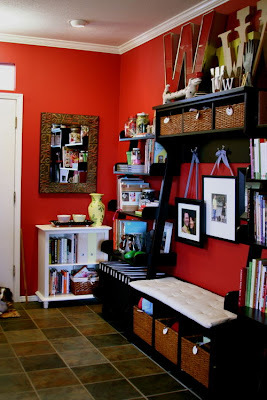 But this area is a catch all for my purse and staging area of stuff that needs to be taken out. 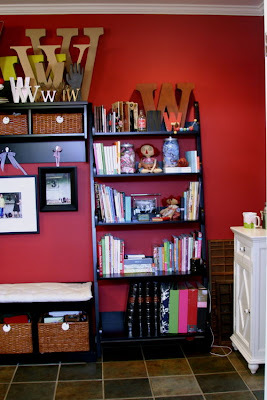 It is also a place where I sit and look at the books before going into my office. It's nice to do this outside of the place you work/create. For me it's a 'clear' area. The bottom baskets are: dog stuff, camera equipment and more mini albums. The last part - the canvas piece was inspired again by Ali Edwards, I can't remember what issue of CK that this was in but it was a couple of years ago. 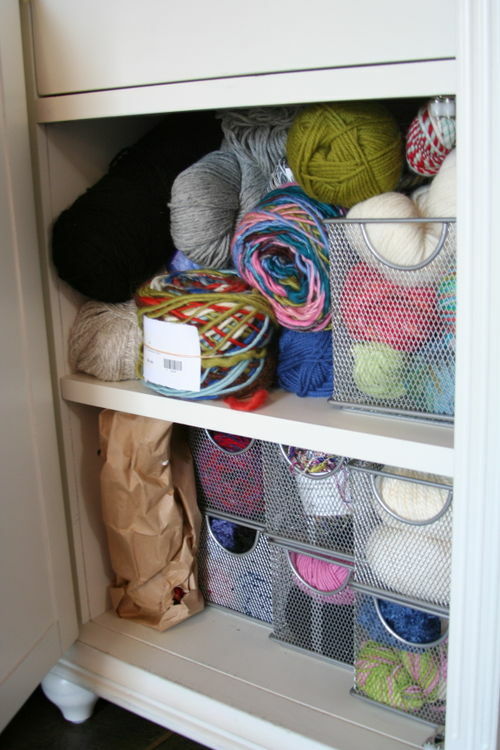 The white cabinet is from Pier 1 and holds all of my yarn and knitting/crocheting tools. The top drawer holds all of my cords - you know all those cords for the hundreds of technology tools we have??? I finally had Maddie organize it and label them. It was out of control! So now I am ready to reveal my super secret storage area. This holds all my back stock and stuff that I don't use on a regular basis but need to have. If I didn't have this area I would be going crazy. Because this is the stuff that isn't so pretty to display. This is right around the corner from my office - it's the closet space under the stairs. 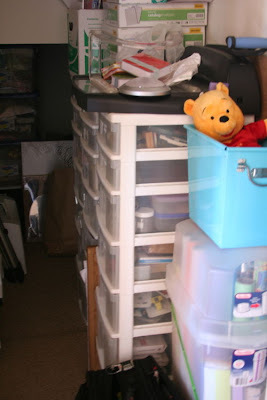 There are three plastic drawer towers. On top of these units are business supplies and my stack paper cutter - I really want one of these... someday! This is where I also store my sewing machine, wrapping paper, pre bought gifts and breifcase. Way in the back you can see totes - these are full of fabric, vintage and new. Inside these drawers are cutting tools (CM circle cutter and the new MS circle cutter), plastic bags, bulk ribbon on rolls, blank cards, envelopes, adhesive (I use one of these and buy my rolls in bulk), liquid glues, pigment ink pads, embossing powder, and packaging supplies. 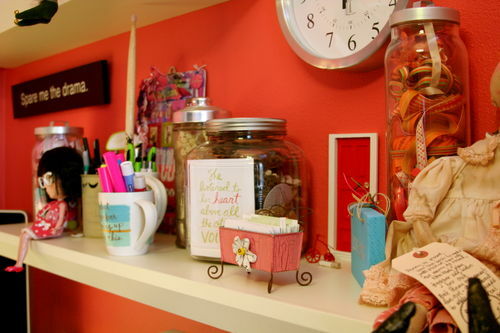 There you have it - and inside detailed peak into a place I spend most of my time. It was interesting for me to get it all down and break it down for you. I am even more confident that my space works for me and I won't be making too many changes in the future. I hope it has inspired you in some way or given you ideas for your own space. Please do not hesitate to contact me with questions. Videos to come very soon! I will be getting back to some of my regular posts: Music Tuesdays and Weight Watcher Wednesdays (ugh) and more organization posts!